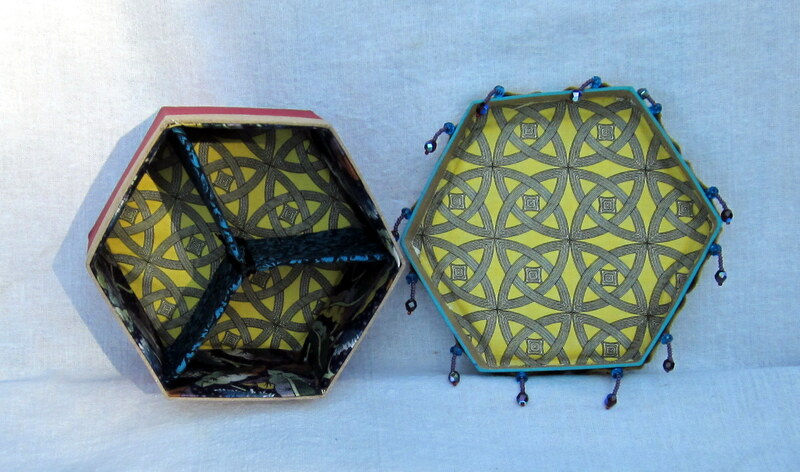 A recent commission, this bee box is 6” across. 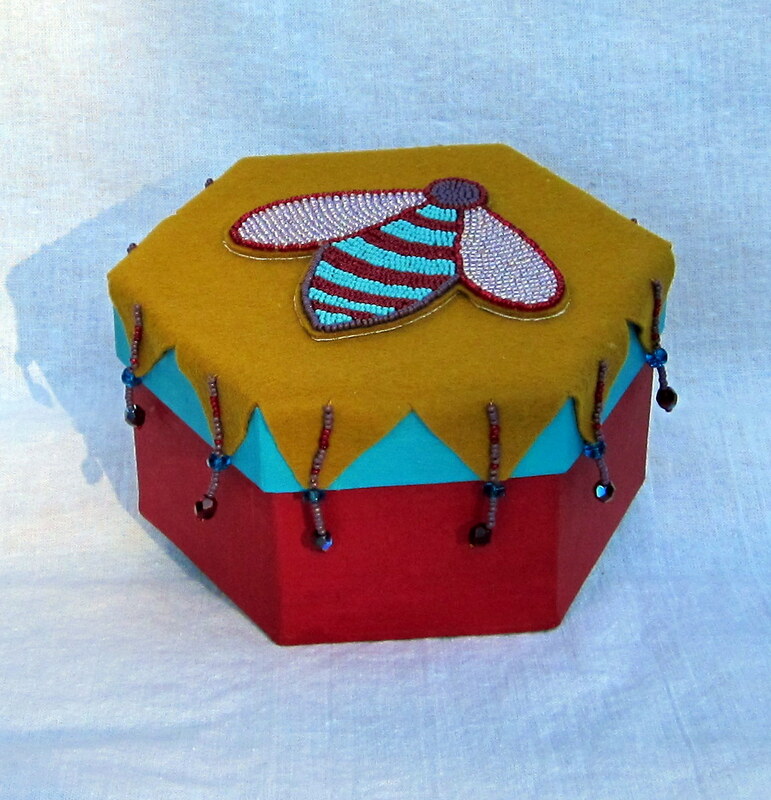 The top bee symbol is beaded using an iridescent bead for the wings, the sides are painted. The interior is padded and covered in cotton with a removable three armed divider. It is a gift for a special person who is a bee keeper. Cut and fire polished beads complete the the lid detail. The colors are favorites of the recipient and the overall color pallet is defined by this. Deep red, soft purple, ocher and aqua. Cut beads through out the whole add a quiet sparkle as the light shines over the surface. 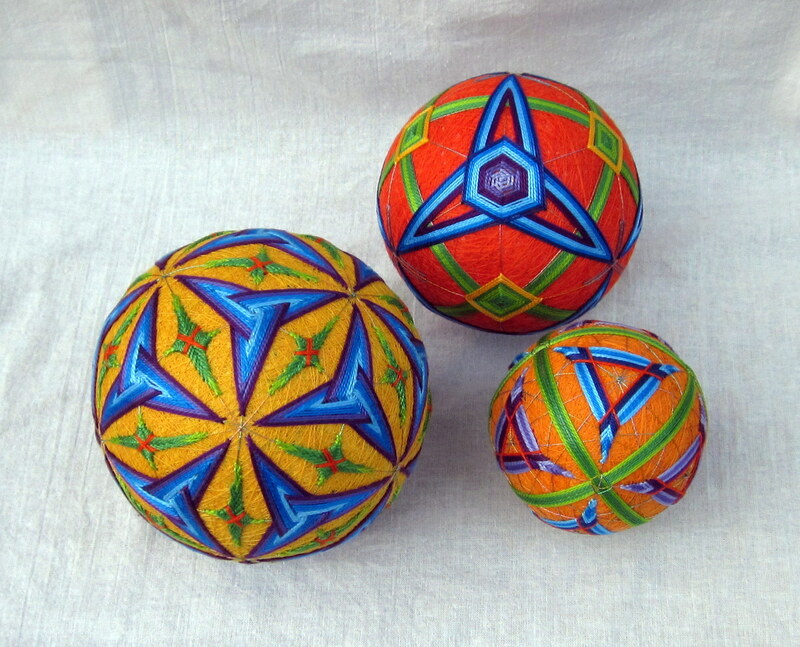 Set of three Temari, each one a different relationship using the three sided figure. Small gold ball is 3 1/2” dia. showing a grid of 8 centers. The orange ball at 4 1/4” dia. has a grid of 4 centers. The large yellow ball at 5” dia. has a grid of 20 centers. The set was challenging to see the various relationships of form and color carry across each design grid, using the space between forms is also becoming more familiar and intrinsic as well. Triangles have always fascinated me and the equilateral forms here were a test of patience. Plotting the grid lines correctly is getting easier, as well as the actual winding of the ”mari” itself. Easier is not the right word, more like consistent and even roundness coming through the effort’s of practice and yet more practice.